Lincoln Military Housing recently partnered with Moving with the Military for a four-part video series on decorating your rental space on a budget this PCS season. If you’re looking for simple, affordable ways to turn your house into a home, these videos are sure to offer insight for decorating just about every area of your space. Our first video will inspire you to totally transform your entryway into a place that you love to come home to — here’s how. · Layer door mats. One door mat just isn’t enough to create a truly textured entry! Outside the front door, place a small, woven rug in a fun pattern underneath an otherwise plain door mat for a creative, designer-inspired look. · Make your own blanket ladder. Head to the local home improvement store and pick up some affordable wood planks to create a rustic ladder for hanging blankets outside. Nail the wood together to create the ladder, then finish it off with the stain of your choice and your favorite blankets. · Hang baskets in place of a wreath. 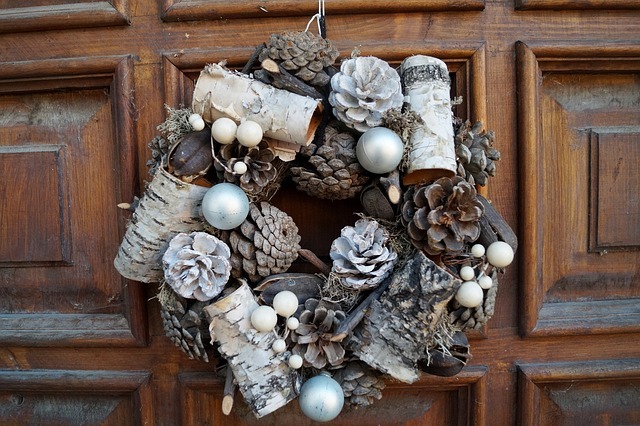 Instead of the traditional seasonal wreath, hang a flat, woven basket from a nail on your front door (or even a few in a row). · Hang useful or decorative items behind the front door. Working with an empty space behind the front door? Hang a “command center” featuring hooks for your keys and a bulletin board for important memos, or a mirror for hair checks before you leave the house. · Add a sofa table to a bare hallway wall. Place a long, narrow table along a bare wall if you have a larger space in the entry. Add a fun painting or mirror above, then place some baskets for keys and other attractive objects on the table’s surface.